Let’s get two things squared away right now. Yes, I really am a Rigger’s Wife. And yes, I really do my own splicing. The Rigger’s Wife is a love story and I’d love to share it with you. It all began in a seaside tavern in Marblehead, beloved and frequented by sailors world wide. There I saw the Rigger talking with friends and went over to say hello. The rest is, as they say, history. The Rigger had been sailing his entire life and recently returned from a circumnavigation around the world in a Hinckley Bermuda 40 with a great friend of his from college. The Rigger was captaining an old wooden 12-meter racing yacht that hailed from Marblehead the day I walked into that well know tavern. To say I was new to sailing would be an understatement. I qualified more as “deck jewelry,” competent only to sit on the rail of this beautiful sloop and try not to get in the way. Somehow I managed not to fall overboard during my first sail on this 65-foot yacht and that summer as we jibed and tacked our way through the race courses of Marblehead Harbor, Nantucket Sound, Vineyard Sound and Narragansett Bay I slowly but surely became a sailor. A few years later, on a beach in Hawaii, the Rigger put a gold wedding ring on my finger and later that summer, on a boat in Vineyard Sound, he placed a gold shackle earring in my left ear; two pieces of jewelry I am never without. Around the time we were married the Rigger began to work in a Marblehead boatyard where he learned his trade from some of the finest riggers on the eastern seaboard. These riggers, who can be identified purely by the quality of their splicing techniques, became the Rigger’s mentors. The hands that have rigged 1000 ships! One of the many constants throughout our years together has been a shared love of dogs. Our first Christmas together the Rigger presented me with a wriggling ball of chocolate fur I decided to call Max. The Rigger began splicing simple leashes for Max using shackles he salvaged from old halyards and line he found in his sail loft. Soon our family and friends wanted leashes for their own dogs and of course he was happy to accommodate. Here’s some early renditions of what was to eventually become the Rigger’s Wife leash. Some of the original leashes, still going strong! Soon I began to join in the fun and The Rigger’s Wife was born. 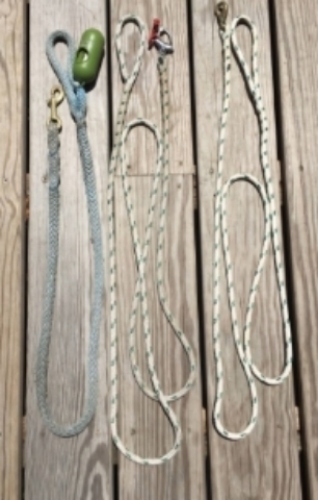 I use the same splicing techniques for my dog leashes and collars that the Rigger learned from his mentors years ago. Although I have remained true to those splicing techniques, I’ve added my own touches here and there, using shiny new stainless steel marine hardware, incorporating brightly colored double braid line and offering fun contrasting colors of thread to whip the splices in place. I’ve also designed The Rigger’s Wife signature Turk’s Head knot up near the handle of each leash. The Rigger’s Wife leashes and collars continue to pay homage to the rich Marblehead maritime heritage that has been passed down to me from the most respected riggers; I’ve just added a bit of whimsy and flair. I hope you enjoy them as much as I enjoy making them for you.